Coach Linder can help you navigate the recruiting process from start to finish! The various levels and scholarship opportunities that are available for softball athletes? How to find a school that can offer you a quality academic and athletic experience? How to get recruited? What steps to take to get on a school’s radar? How college coaches find athletes they recruit? What coaches are looking for in a potential recruit? When the high school athlete should start the college search process? How to make sure you will be academically eligible for the NCAA or NAIA? If you have a strong desire to further your playing career, Coach Linder can help you find a school that is a good fit for you. WHY WORK WITH KAREN LINDER? Coach Linder’s new passion is helping younger athletes reach their dreams. In 2016 Coach Linder started Aspire Higher Sports with a focus on developing the mental side of softball. 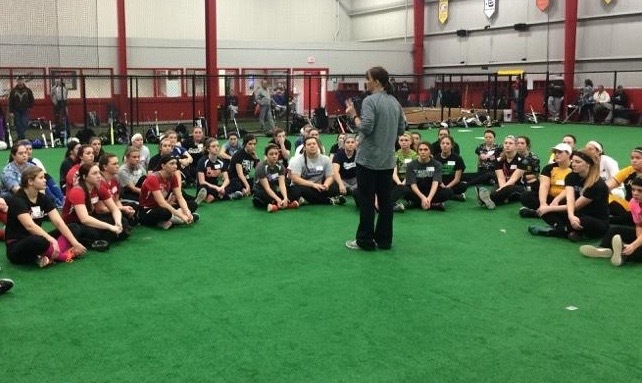 Aspire Higher offers showcase camps, clinics, and instruction for softball athletes of all age levels. As a retired college coach she knows the recruiting process inside out and can help you develop a plan of action. Coach Linder continues to have coaching contacts at all levels of play and can give you direction as to the steps you should be taking to reach your goal. Athletes who are serious about playing in college should begin the process as freshmen or sophomores in high school. The first step involves educating yourself about various types of college programs and identifying schools that will meet your needs so that you can make informed decisions about your path. Coach Linder will meet with the family to share information about the process. Included in the first consultation is a discussion about your goals for college. Each family is given a packet of information that includes examples of email letters, profiles, action steps, and lists of college programs in Ohio and surrounding states. Coach Linder will answer questions, give suggestions, and be available to proof personal letters and correspondence with schools. She will help you get started and can be your personal guide throughout the recruiting process. * One-time in person meeting with the athlete and her parents. This can be up to a two - hour session. *Informational packet - 20+ pages of educational materials with example letters, player profile, and action steps to take throughout the process. *List of conference, college programs and web sites in Ohio and surrounding states that offer softball. *Follow up email and phone access with Coach Linder for 4 weeks after the initial consultation. *Email, letters and profile reviews; answer questions, offer suggestions, and give advice. *All of the above plus unlimited phone and email access for the length of the recruiting process. *A second in person meeting if desired. *Continue to answer questions and give ongoing advice in the decision making process. What better way to navigate the recruiting process than having your own personal advisor who has been a part of the process for over 30 years? Coach Linder knows the ins and outs of the college softball recruiting process as well as anyone in the softball world. Take advantage of this opportunity to use her expertise and experience as an unlimited resource from start to finish. Please note: Coach Linder will give you advice, make suggestions, and answer questions however the expectation is for the athlete to do the work and take the actions needed to find a school that will be a good fit.